Our school workshops and assemblies are listed below. They are all free! The sessions typically last between 50 minutes and one hour. We have differentiated versions to suit different ages and abilities, and we are always happy to further tailor the sessions to match your requirements – just fill in our booking form here. 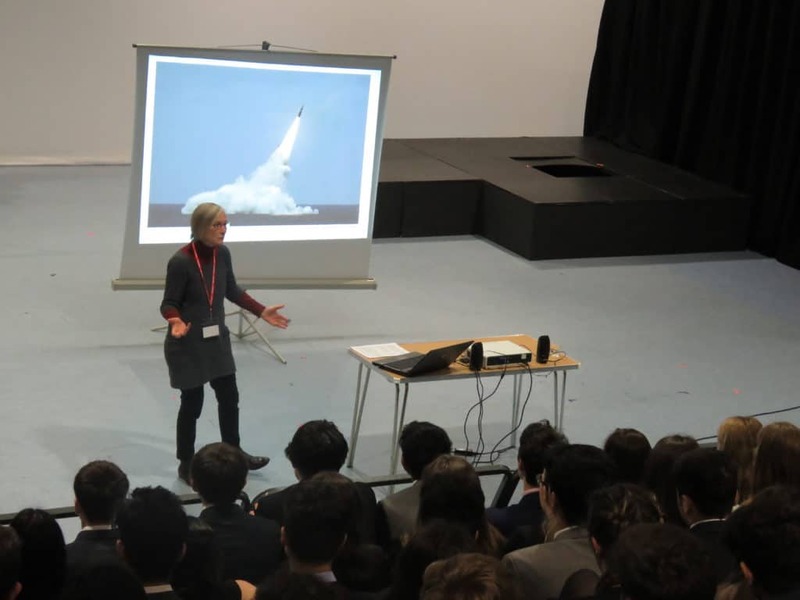 An X Factor-style nuclear weapons debate! Small groups of students prepare a performance or presentation arguing the point of view of an assigned country or organisation. They are assessed by a panel of student judges. You can see The Bomb Factor in action at a school in this Teachers TV video. The teaching pack this workshop is based on has been awarded the Quality Mark of the Association for Citizenship Teaching. We offer several other workshops from this pack, too, including ‘Concepts About Conflict’, and ‘Peace Symbols’, which you can browse and download here. 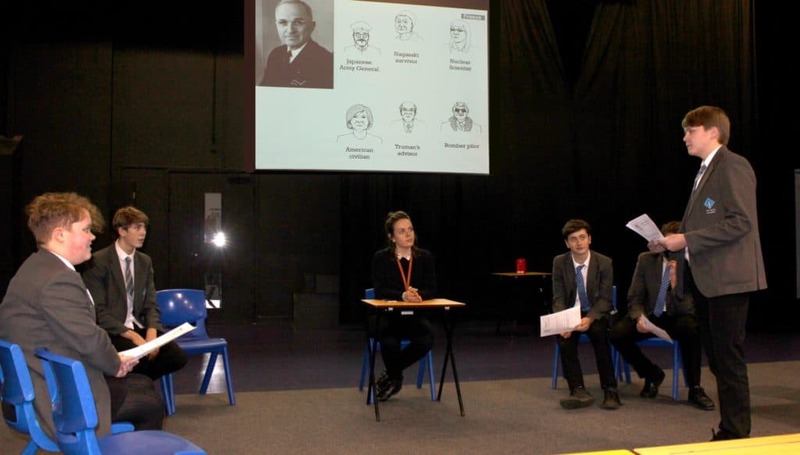 The flagship lesson from this resource sees a mock trial of President Truman hosted in the classroom, with students taking on the roles of barristers, witnesses and jurors to decide whether or not he was justified in authorising the nuclear-bombing of Hiroshima and Nagasaki. They engage with a range of primary and secondary historical sources in the preparation for the trial. The Truman On Trial teaching pack, which was a finalist in the Education Resources Awards 2018, also received accolades in a review from Teach Secondary magazine. It contains RE, History, English and Citizenship-specific lessons, which we offer workshops of. Browse and download these here. This is our newest teaching pack. It explores nuclear weapons themes from the Cold War, and gets students to compare and contrast this learning with the world situation today. It received a fantastic review in Teach Secondary magazine. The most popular workshop from this resource is currently War Game, a decision-making strategy game which puts students in the shoes of world leaders at the time of the Cuban Missile Crisis. To browse the other workshops on offer from this pack click here. 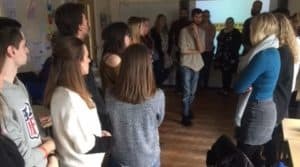 Like The Bomb Factor, the teaching pack that this workshop is based on has been awarded the Quality Mark of the Association for Citizenship Teaching. The students look at examples of pressure groups, and how they operate. Then, in small groups, create their own on issue where they want to see change, and present it to the class. To browse this lesson plan, and the others from the pack click here. 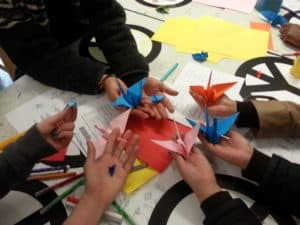 Students learn the story of Hiroshima victim Sadako Sasaki, a young girl who became a global symbol of peace after folding 1600 origami cranes, despite suffering from terminal leukaemia as a result of the bomb’s radiation. They then make their own origami peace crane or swan. This teaching pack featured in the Teach Secondary Resource Guide 2019, where it received a glowing review. The pack’s content is also applicable to KS2 students. Browse the lesson here. The following workshops may be subject to changes as some of the details are still being finalised. Students step into the shoes of state leaders, and try to negotiate nuclear deals without losing face. This workshop focuses on gender and conflict resolution. 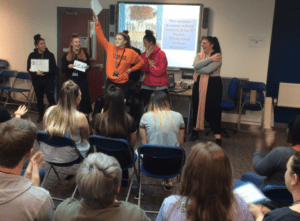 Appropriate in different forms for Drama and English classrooms, students work with source material from the Greenham Common Women’s Peace Camp to explore how identity has been used in peace-building. Students learn about the long-term impacts of nuclear weapons through the testimony of Japanese atomic bomb survivors (Hibakusha). They create their own art in response to this, and compare their creations to actual Hibakusha artwork. This workshop is for the Art/Photography classroom. A mock town meeting is held, where students take on the roles of different stakeholders who must decide on the future of Ranger Uranium Mine, North Australia, as its lease approaches expiry. They work with data, from different viewpoints and must also consider the rights of Aboriginal traditional owners of the land. 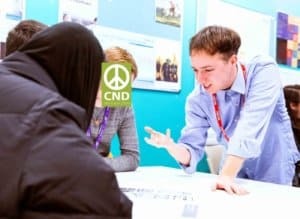 CND Peace Education can facilitate a P4C session with your students, using nuclear weapons stimuli.